Anyone working in the digital marketing space or anyone who ventures online every now and then will know that social media trends are increasingly leaning towards mobile and image based content. If you’re an Instagram or Snapchat aficionado when is the last time you accessed either of them from anywhere but your smartphone or tablet. Actually, hold on, can you access snapchat from a desktop?We assume not. Anyway, the point is, last month Instagram, the Facebook owned app reached a massive 400 million who between them are now posting a whopping 80 million photos a day on the app! Consider these impressive figures with the fact that most of Instagram’s users fall between the ages of 18 & 35 and it should be becoming abundantly clear that Instagram is a no-brainer for educational lead generation. The reason for Instagram’s ardent appeal and continued success is very simple; it has a single focus on the user having a visual experience. To date, higher education institutions have used Instagram to showcase campus life but that’s all set to change. Instagram have been cautious about introducing advertising to its platform. Why mess with a tried and rested formula? They tentatively began by allowing a few select brands advertise but in the past few weeks the floodgates have opened to all! Organisations of any shape or size can now purchase ads on Instagram to help target their intended audience. If you’re on the fence about Instagram advertising for your institution then let us present the case for what makes Instagram any different from advertising on Twitter on Facebook? We could cite a load of statistics, facts and popular opinion but we feel showing you to be much more apt. We have included 2 screenshots of the same image below. The only difference is the first image was posted to Instagram and the second image was posted to Facebook. Notice the sizeable difference in engagement levels. The right call to action on the right advertisement can be incredibly powerful. Instagram lets you feature calls to action just below your ad in addition to including up to 4 images allowing you indulge in some persuasive storytelling! Universities could highlight a particular program with a Call to Action such as “Find out More” or “How to Apply” at the end. Now, I know that all social media platforms personalize sponsored adverts based on interests and past searches and so on but I think Instagram do it especially well. This is going to be so beneficial to colleges and universities advertising on Instagram as the ads shown to individual users will be specific to their interests. This means that your ad gets shown to the right people increasing your chances of a high conversion rate. 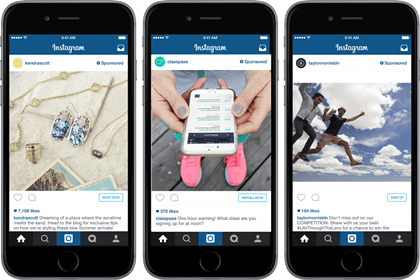 Have you used Instagram Ads yet? Are you planning to? We would love to hear your opinions in the comments below.